''Sunrise, Dart Estuary'' is an atmospheric Stephen Brown oil painting. 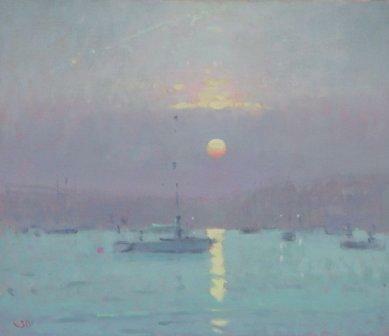 The River Dart is on Brown''s home territory in Devon and often features in his work. Here he has chosen to depict the river at sunrise, the morning mists are rising and the hazy sun is reflected dramatically on the water of the river. The boats on the river would be mainly pleasure craft and are moored and at rest. All is still and quiet. In addition to Red Rag British Art Gallery Stephen Brown has exhibited at other leading British Art Galleries. He has also exhibited his contemporary paintings in North America, Japan, and Europe. Each painting at Red Rag is sourced from the Stephen Brown artist studio and like all Red Rag British art and Contemporary art it can be shipped worldwide.